Charles Gates Dawes was born on Aug. 27, 1865 in Marietta, Ohio, to Rufus "Republic" Dawes and his wife Mary Beman (Gates) Dawes. Charles was the great-great-grandson of William and Mehitable (May) Dawes, through their son William Mears Dawes. His achievements in business and public service were many, but he is best known for serving as Vice President of the United States from 1925 to 1929, under President Calvin Coolidge. He was a co-recipient of the 1925 Nobel Peace Prize for his involvement in stabilizing the economy of Germany after World War I.
Charles married Caro Blymyer in 1889. They had a son, Rufus Fearing Dawes, born in 1890, and a daughter, Carolyn Dawes, born in 1892. Rufus drowned in Lake Geneva in 1912. Soon after, Charles and Caro adopted a son, Dana McCutcheon Dawes, born earlier that year. They also adopted a daughter, Virginia Dawes, soon after her birth in 1914. Charles and Caro died in 1951 and 1957, respectively. 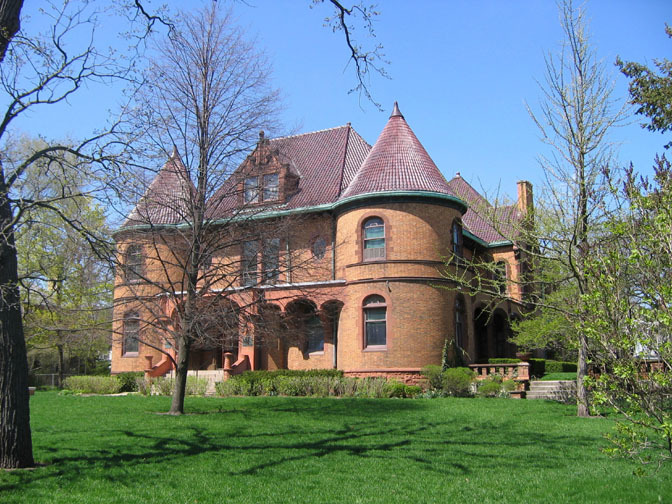 Their home in Evanston, Illinois (pictured below) was left to Northwestern University for use by the Evanston Historical Society, which still occupies it today.